Amazing 3/2/2 available on Valentine's day. 1 story, central heat and air with fireplace. Open floor plan. Great for entertaining. washer/dryer connections. Tile and carpeted floors. Wooden deck in the back yard. Family friendly community. 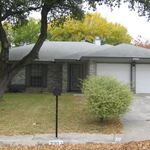 Close to NISD schools, shopping, parks & more! $1295 per month; $1295 deposit. $50 application fee per adult that'll reside in the property. Or you can own this gem for $132K.